So what is HWKR food exactly? 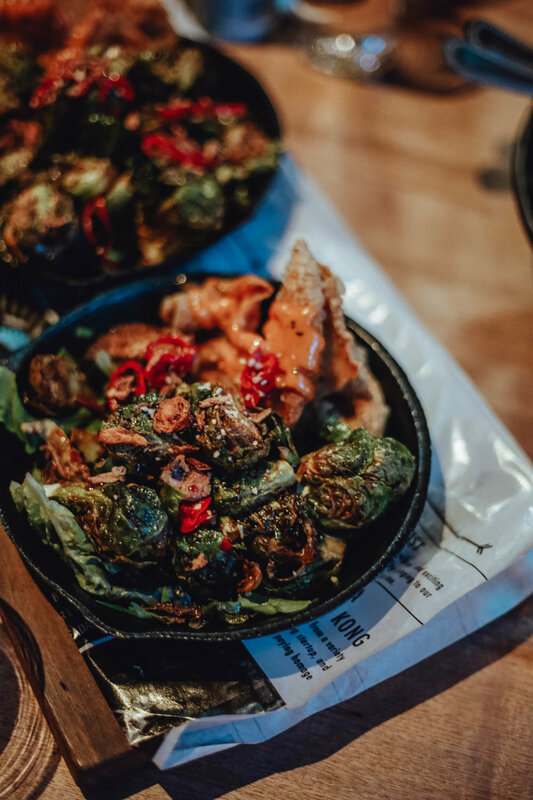 If you're familiar with Asian culture then you'll know that the inspiration for this exciting new foodie concept draws from the very typical, very traditional, hawker food centres that serve up local favorites food court style. Except HWKR totally threw the "cheap n' dirty" aspect of making hawker food... hawker.... out the window and went for refined glam in an ultra modern, there's-no-need-to-worry-about-how-the-plates-are-washed way. 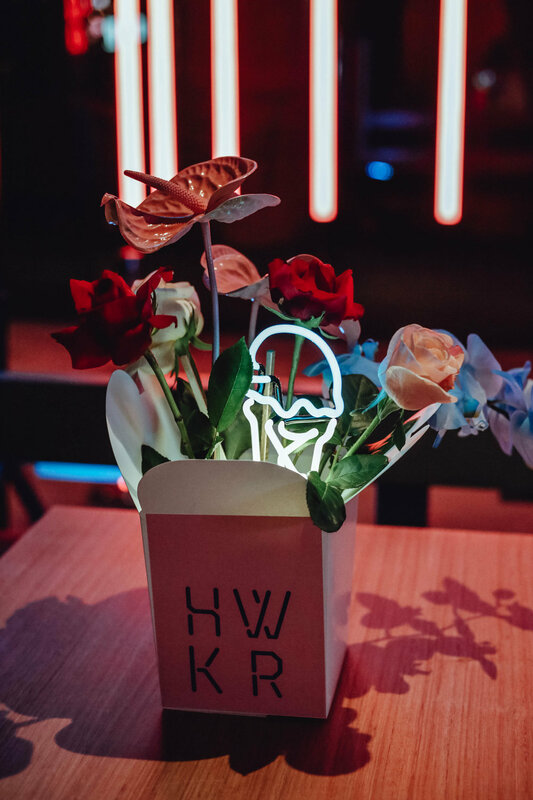 I grew up around hawker centres in Malaysia so its safe to say that I love that the concept of hawker dining has translated into a way we all enjoy here with our favorite restaurants and chefs hot for the picking at HWKR. At the official opening of HWKR last night, I beyond excited to see my fellow Malaysian, Diana Chan - current reigning MasterChef queen - represent our home city with her family recipes at Chanteen (but seriously, as far as punny restaurant names go, does it get any better!?). Given it was opening night, I knew we were in for a treat to celebrating the opening of this food centre which has some pretty hot names in food now at home here, however what eventuated totally blew my mind. 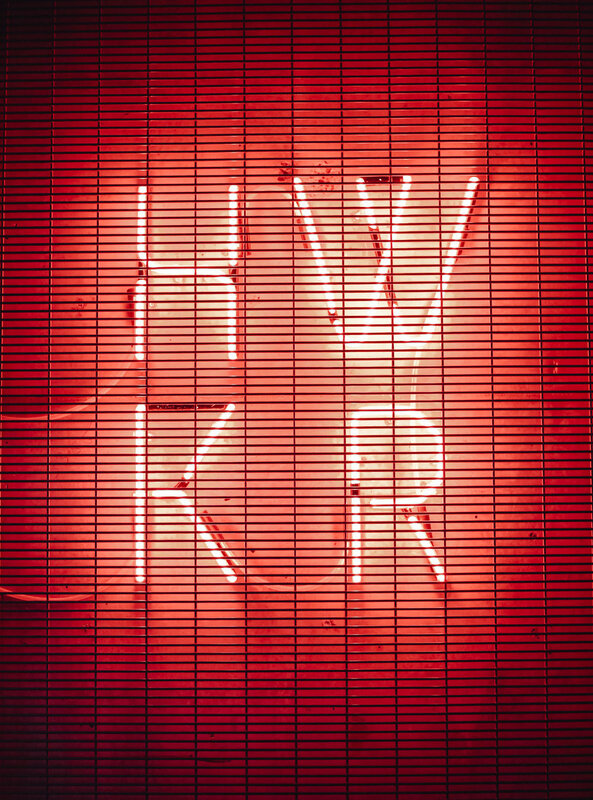 From traditional Asian dances (I was told Jay Chou music was in the mix) to Harajuku girls on scene, launching HWKR was like no other. 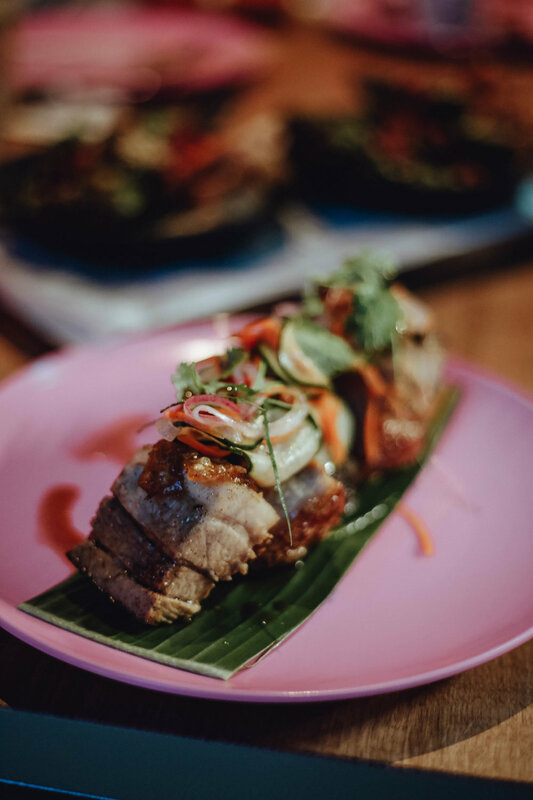 Aside from Chanteen and the crazy good pork belly (pictured above), which was not too fatty, not too salty, just the right amount of crispy, I was thrilled to see Koi Dessert Bar FINALLY make an appearance in Melbourne. 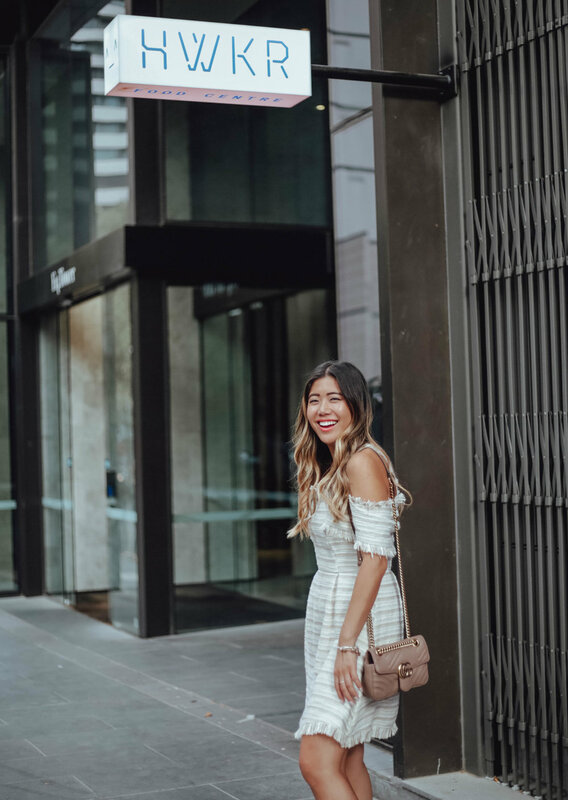 This has been on my long long awaited list after initially spotting the original Koi Dessert Bar in Sydney's Chippendale where I never quite made back to on any of my trips to actually try... but at last I tried THE PEAR! For those curious to wait to find out what's inside... scroll down and all will be revealed! Of the summer limited edition fruit desserts, we indulged in Koi's Reynold Poernomo's interpretation of Pear (eerily similar to its fruit counterpart). 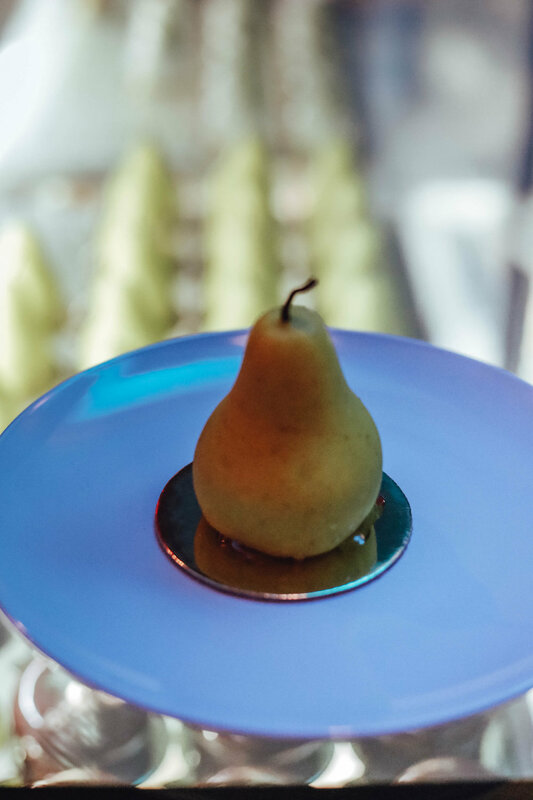 Pear: filled with soft cardamom mousse and poached pear with generous lashings of pear jelly and almond joconde (sponge).